Jaguar has given the XJ its first major update since it launched in 2010 – and a very powerful one at that, in more ways than one. Not only has the big-selling diesel V6 version received a significant power and torque hike, from 275PS with 600Nm to 300PS with 700Nm, but the stereo now has an ear-rattling 1300 Watts pumped through 26 speakers. On sale from autumn this year and priced from £58,690 (another big hike – the starting price was previously £56,870), the new XJ features such status-enhancing equipment as Wi-Fi Hotspot technology plus a much-improved touchscreen and navigation unit that's both more intuitive and - here comes that word again - powerful than before. It's fully iPhone and Android compatible. Android being a type of non-iPhone phone, apparently. Two brand new specifications are available, too: Autobiography, taking inspiration from the flagship Range Rover, plus R-Sport. Visually not much has changed, with Jaguar choosing not to tinker with a limo that remains both classy and distinctive five years after its launch. However, much work has gone into making the overall ownership experience a much more favourable one. The power hike of the diesel, for example, comes alongside a six percent reduction in CO2 emissions, now pegged at 149g/km, and reduced consumption – now a claimed 49.6mpg. At the upper (and far rarer) end of the engine range is a 3.0-litre V6 supercharged petrol with 340PS, a 5.0-litre V8 supercharged with 510PS along with a 550PS version of the same unit, the latter powering the super-sporty XJR model, a snip at £92,405 – though not as expensive as the long wheelbase Autobiography edition, which gets the lesser V8 but costs exactly £100,000. 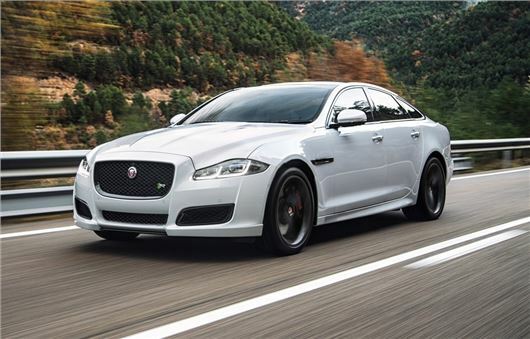 The quickest XJ, the XJR, hits 62mph in 4.6 seconds and tops out at a limited 174mph, putting out 264g/km CO2 and returning 25.5mpg. Hence the relative lack of sales. At the more common end of the XJ market, where diesel is king, there are five trim levels available: Luxury, Premium Luxury, Portfolio, R-Sport and Autobiography. The last of those with a long wheelbase is £80,250, whereas the most expensive short wheelbase diesel you can have is an R-Sport, at £71,625. Every version of the XJ has had its steering system fettled, with a new electric power-assisted setup improving feel and responsiveness, says Jaguar, while lowering consumption. A clever new bit of driver-assistance tech called All Surface Progress Control manages the throttle and ESP on snowy ground, leaving the driver just to steer. Full-LED headlights are now standard, and although Jaguar is yet to announce the entire specification, the company says that there’s been a general bump upwards across the range, with the outgoing Portfolio trim now serving as the Premium Luxury level. We can be sure, however, that a full leather interior, climate control, an automatic gearbox and range of safety systems including lane-keeping tech are standard, and the XJ will now virtually self-park, too. The Autobiography model comes with 20-inch wheels, quilted leather seats and two individual rear reclining chairs, each parked in front of a 10.2-inch HD screen. R-Sport trim, meanwhile, includes front sports seats, piano black or carbon fibre trim, and an exterior body kit including a gloss black mesh grille.